Occupying top spot on the both the Standings and on the Geelong seeded order, Korea Republic’s Jeoung Youngsik and Lee Sangsu won the Men’s Doubles title at the the Seamaster 2018 ITTF World Tour Platinum Australia Open on the evening of Saturday 28th July. At the final hurdle they beat Japan’s Masataka Morizono and Yuya Oshima, the no.2 seeds and winners at the Grand Finals in both Lisbon in 2015 and last year in Astana; a exhilarating straight games win was the end result (14-12, 11-5, 11-7). Fast and furious at full speed from the very first point, neither pair showing a moment’s hesitation, after saving two game points, at the second attempt the Korean duo secured the opening game in a contest where there was little to choose between the two pairs. Any early advantage for Jeoung Youngsik and Lee Sangsu; in the second game they trailed 2-4 before winning the next six points to lead 8-4 and then surrendering just one more point to secure the game and a two-nil overall lead. Exciting rallies but the key factor was at the start of the points, over the table, the Koreans, especially Jeoung Youngsik, proved the superior pair. In the third game, the high level, the blistering pace, continued, Jeoung Youngsik and Lee Sangsu went ahead 5-3, Masataka Morizono and Yuya Oshima called “Time Out”; the break worked but not in favour of Japan. Jeoung Youngsik and Lee Sangsu won the next two points; at 10-5 they held five match points. After taking a “Time Out” at 10-6, the Korea Republic duo secured victory on their third match point; as one week earlier in Daejeon when Lim Jonghhon and Jang Woojin emerged successful, the Men’s Doubles title belonged to the Korea Republic. Notably for Lee Sangsu it was his second title of the tournament, the previous day he had partnered colleague, Jeon Jihee to Mixed Doubles gold. Notably for both pairs, overall, it was their eighth ITTF World Tour Men’s Doubles final, for Jeoung Youngsik and Lee Sangsu their third of the year, for Masataka Morizono and Yuya Oshima, their second. 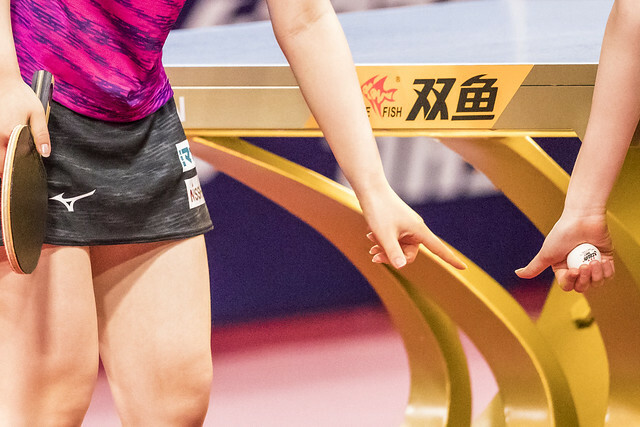 Earlier this year in March Jeoung Youngsik and Lee Sangsu had been beaten in the final in Germany by China’s Ma Long and Xu Xin, before in June overcoming the latter’s colleagues, Liang Jingkun and Zhu Kai to emerged successful in Japan. Previously in 2013, they had won in Poland, in 2017 in Germany, having in 2016 been the runners up in Croatia, Slovenia and on home soil in Incheon. Meanwhile, for Masataka Morizono and Yuya Oshima they had just one defeat against their names in an ITTF World Tour Men’s Doubles final; two months ago in May they were beaten in the title decider in Hong Kong by the host association’s Ho Kwan Kit and Wong Chun Ting. Previously in 2014 they had won in the Czech Republic, the following year in Croatia, before in 2016 succeeding in Poland and Germany; last year they won in Qatar and India. One defeat against their names, in Geelong the number was doubled, both defeats this year; Jeoung Youngsik and Lee Sangsu prevailed, they were outstanding. I doubt they had ever played better.